Five aromatherapy blends of pure essential oils for aroma lamps and diffusers to evoke a unique atmosphere in a beautifully wrapped gift box. M-Moonlight: Blended with lavender, mysterious myrrh and frankincense, it will evoke an atmosphere of deep relaxation after a long day and calm your mind before sleep. C-Celebration: Spices from afar, cinnamon, cloves and nutmeg, with patchouli and orange, will intensify festive celebrations such as birthdays, Easter, Christmas, or Hanukkah. E-Energy: Made from ginger, pepper and lemon grass – it is the equivalent of a double espresso. It will encourage you to achieve greater performance, focus and concentration. L-Love: Exotic blend with vetiver, cedar and bergamot will enhance the space around you with a mood of relaxation, awaken your desire and promote the joy of life. Y-Yarrow: Made from thyme, sage and yarrow – it strengthens courage, improves mood, activates and heightens the senses. We recommend a large ceramic aroma lamp, which is not included in the collection. 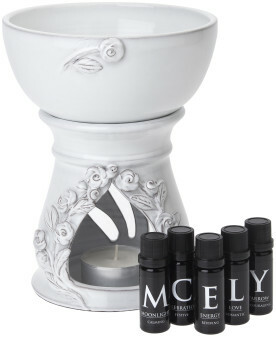 An exceptional large ceramic aroma lamp specially and traditionally handmade with love for the MCELY BOUQUET Collection in a small pottery workshop. This container can hold a greater amount of water and a larger candle can be placed underneath it. Thus it provides fragrance for a longer time without having to add water or exchange candles. The aroma lamp is cleverly wrapped in a hat box. For safe delivery it is possible personally pick up only. Thank you for your understanding.